Go behind-the-scenes on the world-famous Studio Tour for an insider’s peek at sets from your favorite movies and TV shows, including the sets from ABCs hit series Desperate Housewives, The War of the Worlds, and the The Fast and the Furious: Extreme Close-Up. Discount: $8 off general admission plus a second day free. Restrictions: Offer ONLY available online at http://ushtix.com/laincmembers. Cannot be combined with any other certificate or offer. How to get it: Visit http://ushtix.com/laincmembers. 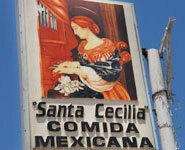 Enjoy the fresh taste of authentic Mexican cuisine at Restaurant Santa Cecilia in Boyle Heights. With no printed menu, you have to ask what is on hand. Of course there are always tortas, tacos, burritos, and caldos (soups), but the other dishes change slightly from day to day. Be sure to try the down-home cooked dishes, similar to what you might find in a neighborhood restaurant in Mexico, they are too good to pass up. Discount: Get one free taco with the purchase of three tacos.